We're off to a great start in 2015 and we're working hard to continue to bring you more great tools to send notifications and re-engage your users for the coming year in all of your apps! 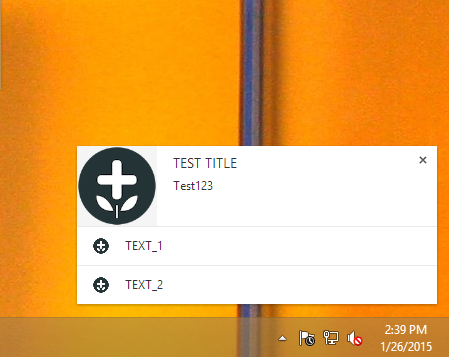 OneSignal now supports sending messages to Google Chrome Applications and Extensions. Like mobile notifications, Chrome App notifications can be sent to users even if they don't have your app currently open. If you publish your app on the Chrome Store, there's no reason not to include notification support. Chrome App notifications are a great way to notify users when you release an update, post news, make app interactions or include reminders to keep your users engaged with your app. Follow the directions here and you'll be ready to send Chrome Notifications in less than 5 minutes. We've improved our notification composer to include explanations for each of the available features. Simply hover your mouse over any of the question marks to learn how to use each option. We've also added the ability to preview your message and see icon placement. We now support Content-Available Notifications (sometimes called Silent Notifications or Remote Notifications) for iOS apps. You can also deliver content-available notifications through our API. Starting February 1st, 2015, all iOS apps and the plugins they use will be required to have 64-bit support. All of our plugins have been updated to have 64-bit support to be compliant. As always, thanks for your continued support and thanks for choosing OneSignal for your Smart Push Notification needs!